The pictures in today's post are a sight for sore eyes. They mean that the water will soon be flowing at the Lazy OD Ranch. We have been looking forward to this day for over 18 months. We paid the tap fee and filled out the application a while back and we were hoping they would be able to get to it soon. They marked the utilities two weeks ago today so I figured they would arrive last week. I was in the barn Monday morning and looked out the front door about 10:00 AM and saw two trucks pulling in and unloading equipment. I was busy but not too busy to watch this! 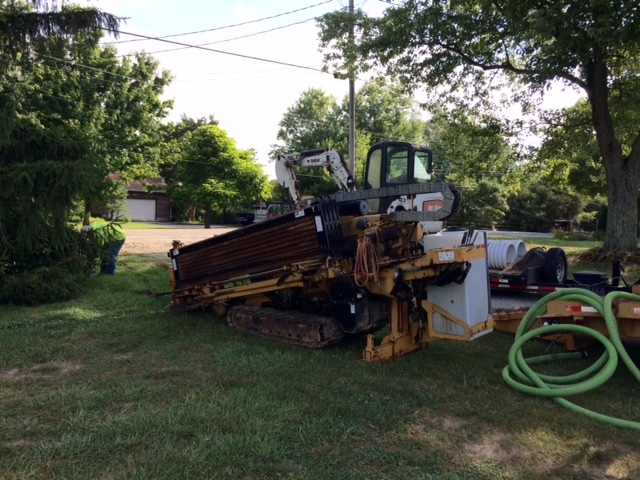 The first piece of equipment was this boring machine. I had never watched a boring machine in action so this was really interesting to me. They bored a hole completely under the road in only a few minutes. It was fascinating to watch and to learn. The second piece of equipment was this small rubber track hoe. They used it to dig the hole where the meter will go and the hole on the other side of the road where they tapped into the main water line. When they say "water tap" they really mean water tap. The saddle goes around the main line and they literally "tap" into it. It was cool to see it. They were completely finished in less than 90 minutes. 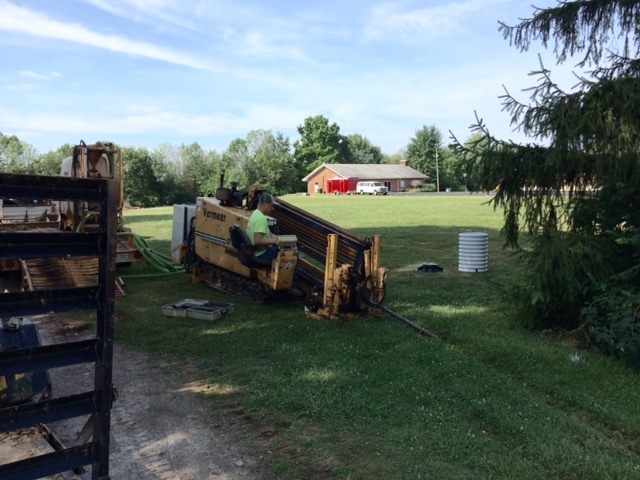 The only thing left to do in order to have water near the barn is to install a little over 300 feet of pipe. Oh and dig the little ol' trench, of course. I will not get to that this trip home but hopefully in the near future I will. That is all the excitement I could stand for one day. Thanks for reading.